The next time Vladimir Putin meets President Trump, he’ll be dealing with a very different man — politically, at least. 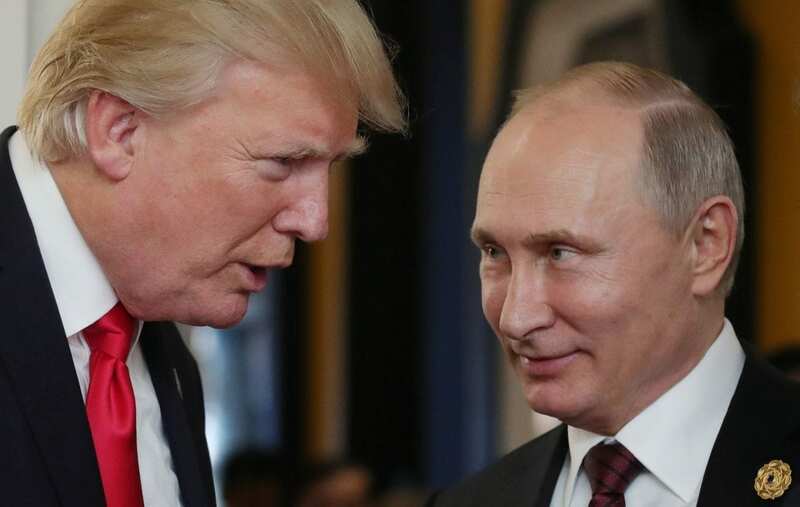 In the months since the two leaders last were face-to-face, Trump has publicly blamed Russia for its attack on the 2016 election, increased sanctions, kicked out a hoard of Russian intelligence officers and closed Russia’s last diplomatic mission on the West Coast. After calling Putin to congratulate him on his re-election, Trump said he expected to meet with the Russian leader soon. White House press secretary Sarah Huckabee Sanders followed up on Monday by clarifying that although talks continue, nothing has yet been arranged. The domestic political and geopolitical environment in which Washington and Moscow might negotiate a bilateral meeting today is quite different from the last time Trump met Putin — during an Asia Pacific summit in November. Trump told reporters after their meeting that he believed Putin meant his denials about interfering in the 2016 election. Fast forward to March 6, when Trump responded to a question about the active measures without any caveats. Since the last meeting, Trump approved new sanctions against a number of Russians or Russian entities named by Justice Department special counsel Robert Mueller in one of his indictments related to the active measures campaign. Trump also took unified action with the British and European governments to kick out a large cadre of Russian officials in retaliation for Russia’s alleged poisoning attack against two people in the United Kingdom. So if Trump meets with Putin again anytime soon, the meeting would take place at a nadir in relations between the United States and Russia even worse than the last time. And Trump no longer will be in a position to accept Putin’s denials about election interference or clandestine violence in the West — he and his allies have already punished him for them. The next milestone for Trump could be on Tuesday when he hosts the leaders of the Baltic states — Latvia, Lithuania and Estonia — in a summit at the White House. The reason for the leaders’ visits is the 100th anniversary of the Baltic nations, but they remain deeply leery about the influence of Russia just over their borders. Baltic and other Eastern European political leaders have sought more deployments by American and other NATO troops to dissuade Russian adventurism, especially after Russia’s invasion of Ukraine. The Baltic leaders will probably be listening closely on Tuesday for Trump to at least sustain his commitment to the Atlantic alliance and especially its members on the frontier with Russia, if not make some kind of new announcement about military postings or other security arrangements. And when Trump spoke to Putin by phone, he did not mention either active measures nor the nerve agent poisoning in Britain, prompting opponents to ask how many of Trump’s actions were real and how many were just a veneer. “The fact that the president did not even bring up the topic of our election security when he called Vladimir Putin to congratulate him on his ‘victory’ — in a pre-cooked election — is extremely troubling,” said Sen. Mark Warner, D-Va., vice chairman of the Senate intelligence committee. Asked to explain the omission, Shah said the administration’s goal is to improve relations with Putin and his government and not to punish if possible.